PA State Rep. Lynda Schlegel Culver - Get Your 2019 Fishing License! 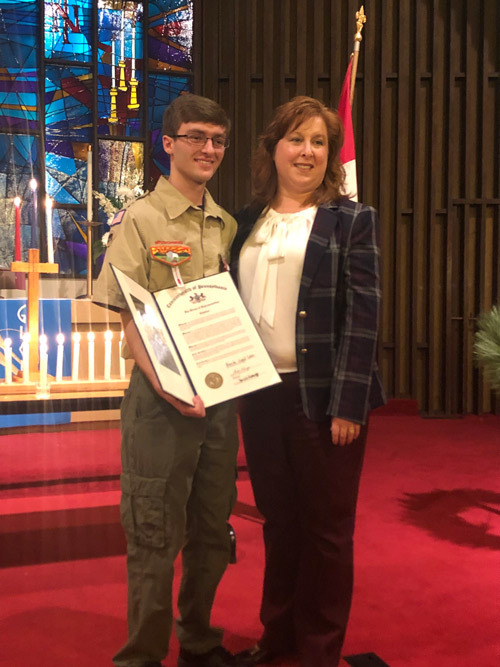 Austin Badman, a member of Troop 331 in Sunbury has recently attained the rank of Eagle Scout, and I was pleased to present him with a citation Dec. 2. The House of Representatives recognizes his steadfast commitment to the ideals and time-honored traditions of the Boy Scouts of America by achieving this rank. Austin completed all portions of the Eagle Award program and fulfilled the community service requirement by constructing 10 double-sided, collapsible display frames for the Northumberland County Fair to help maximize the display area for exhibitors who enter into competitions. He has also served in the leadership positions of chaplain aide, librarian, assistant senior patrol leader and senior patrol leader. Congratulations, Austin! We look forward to seeing your future successes. There have been too many tragic stories in the news lately about children getting hit by vehicles when getting on or off a school bus, including a deadly incident in Pennsylvania in which a 7-year-old boy was struck by a hit-and-run driver. The child was a second-grade student in the Tyrone Area School District.